"Halfway through the service our minister asked the congregation a question. 'For you, what is the most important thing in the world?' Liz and I answered more or less simultaneously. My reply was very proper and holy for a change. 'Salvation!' I cried piously. 'Bacon sandwiches!' suggested Liz, with all the passion and wisdom you would expect from a retired magistrate and area schools advisor for religious education. Yes, I thought to myself. Of course. Bacon sandwiches and salvation. That just about sums it up. 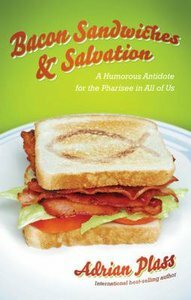 A God who can create the indescribable tastiness of a bacon sandwich must be planning something pretty incredible in the salvation line." Join international best-selling author Adrian Plass in this A to Z laugh-out-loud guide to taking ourselves, as Christians, less seriously.